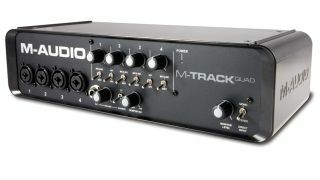 NAMM 2013 PRESS RELEASE: Cumberland, R.I. (January 24, 2013) - M-Audio has announced their new M-Track Series of USB audio/MIDI interfaces. Offering three distinct models, the M-Track Series combines a robust feature set with extreme ease of use to create versatile audio/MIDI interfaces for every level of musician. Starting with phantom-powered XLR jacks, line inputs with guitar-level switching, TRS audio inserts, and latency-free monitoring, the M-Track Series provides a comprehensive range of inputs, outputs, and connection options designed to work efficiently in the modern studio or on the go. Simple controls, effective metering, and rugged chassis make the M-Track Series ideal for withstanding the rigors of day-to-day use. From the entry-level M-Track to the pro-line M-Track Quad, each model offers a reliable platform that can accommodate the myriad of devices that can come and go in a changing project studio. "With a deep feature set and solid build, the M-Track Series provides each musician with the best value in audio interfaces available today," according to M-Audio Product Manager Dan Steinberg. "Each model continues the M-Audio tradition of delivering a level of versatility, performance, and value that sets new standards among audio/MIDI interfaces. In addition, each interface includes Ignite by AIR music creation software; the Plus and Quad models also include Avid® Pro Tools® Express - complete with iLok - providing a tremendous advantage." This entry-level model offers two-channel operation. Each channel provides both XLR and 1/4" inputs. Phantom power (48V) and guitar-level switching are provided. Professional audio converters and discrete preamp design deliver up to 24-bit, 48 kHz digital audio for use with virtually any software. 4-segment LED metering and multiple status lights provide real-time visual feedback. A single USB cable provides both power and data, making setup a snap. Intuitive controls include individual gain knobs, a convenient zero-latency mix knob, plus a headphone output with its own level knob. MIDI in and out jacks are provided, in addition to the balanced main 1/4" outputs. Ignite by AIR music creation software and Ableton Live Lite 8 complete this powerful package. At home in the more advanced digital studio, the step-up M-Track Plus is built on the M-Track's foundation, with the addition of coaxial S/PDIF digital input and output jacks on the back panel and a robust metal casing. M-Track Plus comes equipped with Ignite by AIR music creation software plus Avid Pro Tools Express, complete with the iLok USB key—a $49.99 value. The flagship of the family, M-Track Quad offers up to four simultaneous audio inputs. As with the entire M-Track family, the M-Track Quad features four individual mic inputs with selectable 48V phantom power, 1/4" line inputs with guitar-level switching, and per- channel audio inserts. A second set of outputs operates independent of the monitor level control, providing extra versatility. The four-channel M-Track Quad includes an AC power supply plus three USB outputs, allowing it to function as a powered USB hub. M- Track Quad also comes equipped with Ignite by AIR music creation software plus Avid Pro Tools Express, complete with the iLok USB key—a $49.99 value.